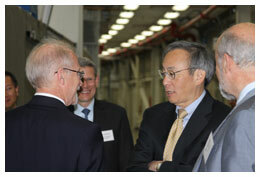 U.S. Department of Energy Secretary Steven Chu visits HPCAT on Friday, June 3. Russell Hemley presented an overview of HPCAT and led the tour for the delegation, which included the University of Chicago President Robert J. Zimmer and ANL Director Eric Isaacs. The Secretary was visiting ANL to participate in the new Energy Sciences Building (ESB) groundbreaking ceremony.